On September 13, 2013, Terra Mater, the nature and science magazine from Red Bull Media House Publishing GmbH, was awarded with the renowned Lead Award in the category of Reportage Photography of the Year. The honor recognised the magazine for historic photography featured in what was only its second issue (September 2012): Entitled “The Russian Empire of Czar Nicholas II,” the piece presented the work of Sergei Michailowitsch Prokudin-Gorskij, a pioneer of color photography whose vivid – but all-too-seldom seen – images documenting the last years of the czarist empire achieved a quality and realism that looks remarkably contemporary today. 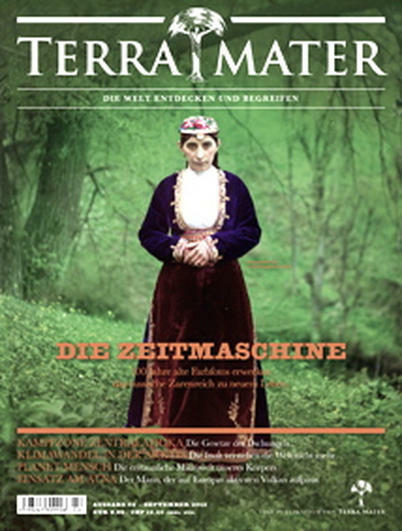 Distributed bi-monthly and dedicated to taking readers on journeys that are both inspiring and educational, Terra Mater consistently pursues new, innovative ways to share reportage. The Lead Awards are Germany’s leading awards for print and online media, and Red Bull Media House editors gratefully acknowledged the honor as motivation to continue raising the bar in the production of premium magazines, online publications and apps. For more information about the magazine and its content, have a glimpse at the website of Terra Mater Magazine.